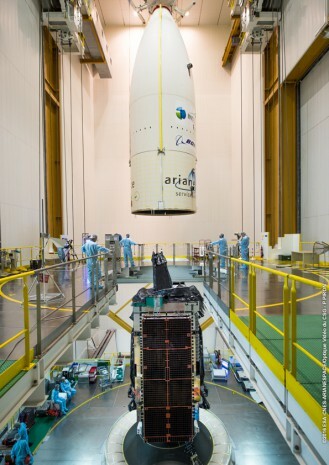 Ariane 5’s core cryogenic stage for Flight VA229 is moved into position over the mobile launch table during activity in the Spaceport’s Launcher Integration Building. The second Ariane 5 for launch by Arianespace in 2016 has begun taking shape at French Guiana, as build-up of the heavy-lift vehicle is now underway in the Spaceport’s Launcher Integration Building. Following a well-established assembly flow, the process began with this week’s positioning of the launcher’s central core cryogenic stage over one of two mobile launch tables utilized for Ariane 5. Next will be integration of the two large solid propellant boosters – which are installed directly on the launch table, followed by placement of the combined vehicle equipment bay and upper stage unit atop the core stage. 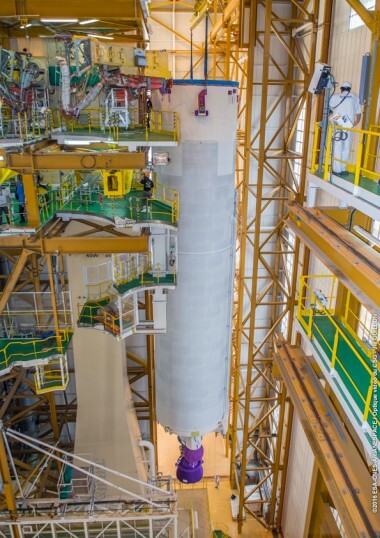 This activity is performed under the direction of industrial prime contractor Airbus Safran Launchers, and will lead to Ariane 5’s subsequent transfer to the Final Assembly Building, where Arianespace takes responsibility for payload integration, final checkout, and the launch operations. Designated VA229 in Arianespace’s launcher family numbering system, the upcoming mission is planned in early March with the EUTELSAT 65 West A relay satellite for Eutelsat. EUTELSAT 65 West A is to offer coverage for Latin America in C, Ku and Ka bands – providing video distribution and direct-to-home broadcasting, along with flexible high throughput for broadband access. After deployment by Ariane 5 into geostationary transfer orbit, the Space Systems Loral-built (SSL) satellite will operate at position of 65 degrees West. Arianespace is planning up to eight Ariane 5 missions in 2016 – which would be a new operational record for the heavy-lift launcher. Also on the company’s manifest this year are one flight with its medium-lift Soyuz and two using the lightweight Vega launcher. The year-opening Ariane 5 flight is set for next week, with Intelsat’s Intelsat 29e telecommunications satellite to be lofted from the Spaceport on January 27.